Whether hiking or commuting to school, the SOG Ninja Daypack keeps you organized for any adventure with a variety of compartments, MOLLE webbing for attaching accessories, and hydration pack access. 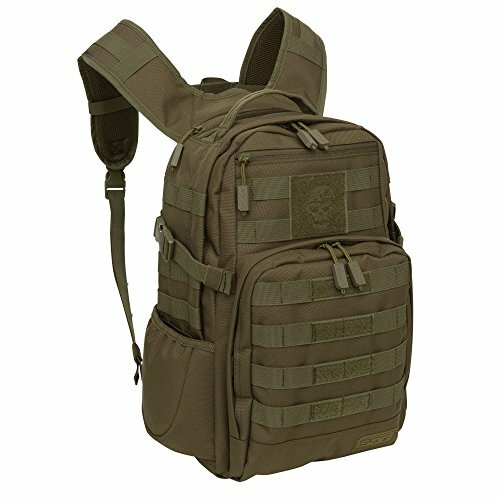 This 24.2-liter tactical backpack features a large main compartment, front accessory pocket with organizer, a small accessory pocket for flat item storage, and a soft-lined pocket at the top for eyeglasses and electronic devices. You’ll be able to quench your thirst wherever you roam with a hydration bladder pocket featuring a tubing port for easy access to H2O (hydration reservoir sold separately; fits up to 2-liter bladder) and a stretchy side pouch that fits most water bottles (sold separately). When you need to carry more gear, the Ninja Daypack has you covered with side compression straps, bottom lashing loops, and heavy-duty MOLLE webbing for attaching a variety of optional pouches, accessories, and modular tactical gear. The military-style Ninja Daypack sits comfortably on your shoulders thanks to the yoke-style adjustable, padded shoulder straps, which feature an adjustable sternum slider for added security and comfort. The breathable padded mesh back keeps you comfortable over long hauls. Other features include durable water repellent construction, a hook-and-loop patch on the front for added customization, top carry handle, durable plastic buckles and zippers, four points for attaching a sleeping bag or roll, and dual bottom grommet drainage holes to help keep water from pooling around your gear. This product is backed by a manufacturer’s lifetime warranty against defects in materials and workmanship (applies when product has been used for the purpose intended and under normal conditions). SOG backpacks, hydration packs, and bags match the uncompromising style and performance of its celebrated folding knives and multi-tools, which have become prized by military, law enforcement, and everyday users looking for outdoor gear of the highest quality, distinction, and value.